About 45 percent of Americans snore from time to time, and 25 percent habitually saw wood. Snoring is more than an annoyance to your bed partner. It could be a sign of pauses in breathing called sleep apnea, which could lead to serious medical complications. You snore when air encounters an obstacle while trying to make its way into the air passages in the back of your nose and mouth. Instead of the air flowing freely downward, it pushes the tongue and upper throat against the soft palate and uvula, producing a noisy vibration. If the sound bothers your partner or keeps you awake, you might be wondering how to stop snoring. You can start with an evaluation by your primary care provider or an ear-nose-throat (ENT) doctor. Sleep apnea is treated with a machine called continuous positive airway pressure (CPAP), which gently blows air into the mouth throughout the night to keep the air passages open. 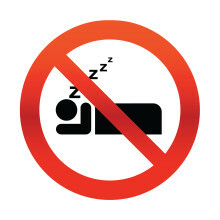 Other advice on how to stop snoring centers on lifestyle interventions. Don’t sleep on your back, the position in which you’re most likely to snore. If you naturally tend to flip over while you sleep, tape a few tennis balls to the back of your pajamas to keep you on your side. You can also elevate the head of your bed a few inches, which will help air flow into your airways more easily. Being overweight is one of the main risk factors for sleep apnea. Weight loss can dramatically improve sleep apnea symptoms. Also, avoid alcohol in the hours before bed. Alcohol relaxes the muscles in the back of your throat, making you more likely to snore. Sleeping pills and sedatives can have a similar effect. Establish good sleep habits. Go to bed at the same time each night, and wake up at the same time each morning. Keep your room dark, cool, and comfortable to help you fall asleep and stay that way. Would You Benefit From a Snoring Mouthguard? When it comes to figuring out how to stop snoring, some desperate people may be willing to try anything—or suggest anything to their bedmates. There are no guarantees, of course, but you may find a snoring cure that works for you or your partner.